This complex has had a number of name over the years. Elkins Brewing, Elkins Cold Storage, Elkins Provision. On the 1923 Sanborn map above it is noted as the Elkins Produce and Storage Company. The 1925 WM Shippers Guide notes the customer as the Elkins Provision Storage Company. Guess I better check the 1926 phone directory to be certain. The image above is from 1926. I believe the structure stood until the late 1980's as it shows up in the background of images taken near the station. Note a Darden Supply building just across the tracks to the right of the Elkins Provision Storage complex. The Coal and Coke connetion is in the background. 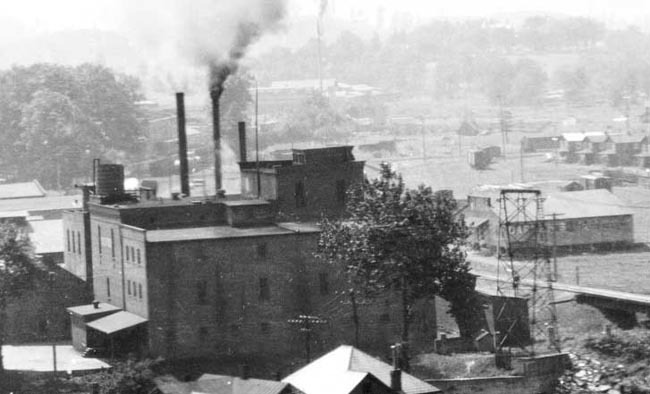 This image is just to the left of the one above and shows the public side of the Railroad Avenue industries. In the distance is the Standard Oil depot that bordered the Coal & Iron line to Durbin. More maps and images are on page 2 of Prototype Info.